We have Just Sold out of Star Wars Episode VII The Force Awakens Captain Phasma Stainless Steel Pendant Necklace. This Item is unavailable at present. From the Star Wars collection by Body Vibe. 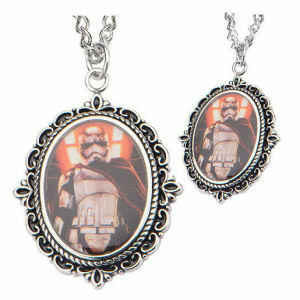 Star Wars Episode VII The Force Awakens Captain Phasma Stainless Steel Pendant Necklace. The necklace is made of stainless steel and includes a 18-inch chain. Pendant measures 1.125 inches long.